Who’s top dog in the search engine world? ASK the Chihuahua! Hitwise, a well-known company that monitors Internet use, has a description on its website of how the UK search engine market share is divided up. Google predictably reigns with its omnipotent 90%-ish share of online search; it is further down the ranks that the real contest kicks in. So, with the top-dog slot firmly taken, where do the other engines rank? 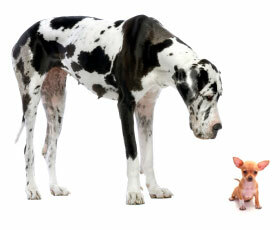 If Google is the Great Dane of the search engine world, who is the Saint Bernard and who is the Chihauhau? I've combined the .com and .co.uk google here, and it is worth noting that both the Ask and Yahoo engines are the UK versions. ##Hit-not-so-wise? This data seemed a little odd to us here at Distilled so we decided to do our own mini-poll using a few of our clients. On average, google got the expected 80-90 % market share, but the other results differed widely from those listed on Hitwise. *There was too little search volume for this client on these search engines for Analytics to report. The next highest average award went easily to Yahoo (although Analytics does not differentiate between the UK and .com version) with a comfortable 5.7% of the market share. Compared to this, Ask had a paltry average of 0.57%. Not only this, it is soundly outdone by Live (an average of 2.75 %), MSN (an average of 1.89 %) and AOL (an average of 1.04 %). As a quick aside, I have chosen to keep MSN and Live separate because, unlike google.com and google.co.uk, there is much more likelihood of a user consciously and consistently choosing between versions. Now, it's true that Hitwise used a much wider comparison base than we did and we are by no means implying that their data is incorrect (or unwise! ), but it is difficult to explain how these results could somersault so dramatically. ##Ask a lot of questions According to all the analytics stats that we can get our hands on we have not seen referral traffic in the 3% range for Ask for a good few years now. A quick brainstorm later and we aren't much wiser. The only possible explanation we came up with that didn't rely on hitwise having dodgy data was the fact that Ask, more than any other engine, encourages you to refine or expand your search. It'd be great to see stats on how many people don't get the exact results they want first time round and, rather than choosing another keyword, use a suggestion that Ask comes up with. That would effectively mean that although the number of unique searches on Ask is fewer, the search volume is increased by the number of times each search is 'refined'. Could the difference between the hitwise data and what we see be simply down to people refining their searches? In my opinion it seems unlikely, and it relies on the hitwise data coming from a 'number of searches made' rather than 'number of URL's hit' point of view, but that's us out of ideas I'm afraid. Does anyone else know of any reason why the Ask numbers seem inflated, or is it just that our numbers are wrong?